TeamSnap, the household name in integrated sports management, has partnered with Champion Athleticwear to be the official provider of custom fanwear sold through TeamSnap's Team Store. The Team Store ecommerce platform gives TeamSnap's 20 million users direct access to purchase custom branded Champion apparel through the popular app. This is the first of its kind partnership in the sports management industry to merge team information and on-demand, custom fanwear printing technology. 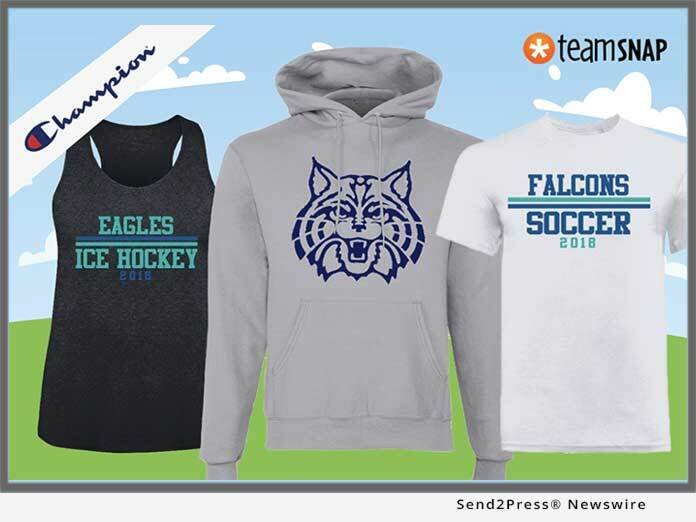 Coaches, players and parents on TeamSnap can now order an array of Champion products - such as t-shirts, hoodies, jackets, sweatpants and accessories - that represent their teams. The Team Store allows teams to easily customize the merchandise to showcase their team colors, name, logo or mascot. Team members can order their branded apparel at any point throughout the season, with no minimums or constraints on when orders can be placed. "We are thrilled to be giving our teams direct access to custom branded apparel from Champion's high-quality athletic wear," said Dave DuPont, co-founder and CEO, TeamSnap. "This really is a game changer for teams and supporters looking to show their pride. No longer do teams have to endure long waits, bulk order requirements and time constraints and hassle of dealing with merchandise vendors. Our mission is to help everyone spend less time organizing and our partnership with Champion makes ordering team apparel easier than it has ever been." "TeamSnap has more than 20 million users and two million teams who engage with their platform every day. Connecting the expansive line of Champion products from inside the TeamSnap environment is an incredibly exciting endeavor for us" said Tyler Lewison, General Manager of Champion Team Athletics. "Having the Team Store embedded into the TeamSnap app simplifies the ordering process for teams nationwide and allows Champion to continue being a leader in outfitting the next generation."